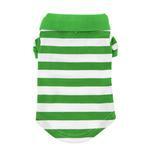 Posh pups will love the feel of this Striped Dog Polo in Greenery and White! The Striped Dog Polo in Greenery and White by Doggie Design is a sporty look with their signature logo on the collar. This 100% cotton pique polo will be a great way to have your dog stand out. This dog polo is perfect for any occasion where your dog wants to be dressy without sacrificing comfort. This lightweight polo is easy to wear with pearlized buttons that make dressing a breeze. The tailored ribbed sleeves and high-cut stay-dry belly provide a great fit. We love the vibrant stripes and green and white colors of this classy dog polo. This could be part of a St. Patty's Day outfit and would be a great choice for Easter. It would be a classy look on the golf course or at barbecues. Made of 100% cotton. Hand wash or machine wash in cold water on a gentle cycle. Line dry to prevent shrinkage. Sure to be a favorite in your closet of pup clothes. Check out the other Doggie Design dog polos in solid colors and striped designs, sold separately. Striped Dog Polo by Doggie Design - Greenery and White Customer Photos - Send us your photo! Blue and Ridge love their new polos! They enjoy showing off their new attire at the office and on daily walks in the neighborhood! Roscoe is our little Brussels Griffon/Shihtzu mix. He always looks adorable in his duds from Baxterboo. Look at this cutie in his new polo! Posted On 04/19/18 by Sasha from South Richmond Hill, NY Yes, Sasha recommends this product! Our Maltese looks too adorable in his Polo shirt! We love it! Great design and color! Posted On 02/20/18 by Angel Z from , Yes, Angel Z recommends this product! Great product! My dog looks really cute in this polo!?? Posted On 08/17/17 by Deborah M from Saint Petersburg, FL Yes, Deborah M recommends this product! Love this smart casual fashion option! It's a more dressed up look for my male dog to coordinate with my female dogs when they are wearing summer dresses. Nice to have a more dressed option to T-shirts occasionally. The cut is great for male dogs to help keep their underbelly clean. Sizing chart is accurate. Posted On 08/11/17 by Melissa M from Orlando, FL Yes, Melissa M recommends this product! Mickey looked really cute in this green-striped polo. He wore it for the first time to Dinosaur Day at doggy day camp. This fits very well, very true to sizing. Great quality product, well made. Posted On 08/08/17 by Lindsay P from Brook Park, OH Yes, Lindsay P recommends this product! Posted On 07/07/17 by Danyelle C from Calera, AL Yes, Danyelle C recommends this product! My lil man looks so handsome in his lil striped polo. The fit is perfect and it is so soft and comfortable for him. Posted On 07/06/17 by Cyndi A from , PA Yes, Cyndi A recommends this product! Well made and very cute. Posted On 06/10/17 by Susan M from , MA Yes, Susan M recommends this product! Our boy is adorable in this short. I even got him the red and white shirt. Posted On 05/15/17 by Belinda M from Austin, TX Yes, Belinda M recommends this product! Need to return. Its way too small. My yorkie takes a small but this barely fits him. Posted On 05/12/17 by Karen M from , OR Yes, Karen M recommends this product! Loved this shirt! It fits as expected and is very well made. Pretty fast shipping too. Thank you, Baxter Boo! Posted On 04/19/17 by Amy B from Port Saint Lucie, FL Yes, Amy B recommends this product! We get more compliments...Stylish and wears and washes well. So cute and well made! Posted On 03/30/17 by Kelley M from Olympia, WA Yes, Kelley M recommends this product! Got three of these shirts for my three boys. Roscoe got this green striped polo. It is really well made and the little doggy face emblem on the collar is adorable. It does run a bit long in the back but not enough to worry about. I LOVE this company, had a great experience with them! I had to return one of my dog`s coats and reorder correct size, everything was timely and coats are of great quality. I really enjoy the videos also.